In mid-September, European Union (EU) Commission President Jean Claude Juncker delivered the Commision's annual State of the Union address.1 Coming on the heels of the British vote to leave the EU, the address provided a roadmap for overcoming the challenges brought about by what Juncker termed an “existential crisis.” Among the key components of the roadmap were several initiatives related to defense and security. For example, Juncker noted rather bluntly that Europe could not rely on soft power alone and that it therefore needed to “toughen up.” This was music to Washington’s ears, particularly when Juncker went on to argue for Europe to stop “piggy-backing” on the military might of others (read: Washington). European countries already appear to be heeding his call. After years of flat budgets and defense austerity, there is a growing body of evidence that European states have in fact begun to increase defense spending over the last couple of years.2 Although some European states, such as Poland, have been increasing defense spending—if only slightly—for many years, evidence now indicates that such increases are broad-based, if perhaps uneven. For example, recent defense spending increases in Eastern Europe are greater than what is occurring in Northern or Western Europe. Regardless, Juncker was right to promote and encourage this emerging trend. The full story of the July 15-16, 2016, Turkish coup attempt may not be known for some time, but it is clear that a limited number of officers attempted to overthrow the government and either capture or kill elected President Recep Tayyip Erdogan. The government has accused these officers of belonging to the Fethullah Gulen movement (Hizmet), which is certainly possible since many of Turkey’s most secular military leaders were removed in earlier purges when Erdogan and Gulen were allies. These secular senior officers were often replaced by individuals associated with either the ruling Justice and Development Party (AKP) or the Gulenist movement, which the government did not view as a threat prior to 2013.1 Since then, Erdogan has viewed Gulen as an enemy, and the clerical leader has remained in voluntary exile in Saylorsburg, Pennsylvania.2 Erdogan is now seeking Gulen’s extradition to Turkey on charges of masterminding the coup, but his government has produced no clear evidence to back up that request. The momentous decision of British voters to leave the European Union (EU) is already having major repercussions in both economics and politics. In the former, investors fled uncertainty for more stable opportunities, while in the latter there are already calls for another Scottish independence referendum. In the worlds of defense and security, the implications are less clear, at least in the short run. What appears far more certain though is that the economic and political implications are likely to have profound long-term effects on NATO, U.S. national security, and the U.S. Army’s relationship with one of America’s closest allies. In response, and in order to mitigate the most damaging effects of the Brexit vote, the United States needs to intensify military cooperation with a longstanding UK rival – namely, France. The development of cyberspace defense capabilities for the North Atlantic Treaty Organization (NATO) has been making steady progress since its formal introduction at the North Atlantic Council Prague Summit in 2002. Bolstered by numerous cyber attacks, such as those in Estonia (2007), Alliance priorities were formalized in subsequent NATO cyber defense policies adopted in 2008, 2011, and 2014. This monograph examines the past and current state of cyberspace defense efforts in NATO to assess the appropriateness and sufficiency to address anticipated threats to member countries, including the United States. The analysis focuses on the recent history of cyberspace defense efforts in NATO and how changes in strategy and policy of NATO writ large embrace the emerging nature of cyberspace for military forces as well as other elements of power. It first examines the recent evolution of strategic foundations of NATO cyber activities, policies, and governance as they evolved over the past 13 years. Next, it outlines the major NATO cyber defense mission areas, which include NATO network protection, shared situational awareness in cyberspace, critical infrastructure protection, counter-terrorism, support to member country cyber capability development, and response to crises related to cyberspace. Finally, it discusses several key issues for the new Enhanced Cyber Defence Policy that affirms the role that NATO cyber defense contributes to the mission of collective defense and embraces the notion that a cyber attack may lead to the invocation of Article 5 actions for the Alliance. This monograph concludes with a summary of the main findings from the discussion of NATO cyberspace capabilities and a brief examination of the implications for Department of Defense and Army forces in Europe. Topics include the roles and evolution of doctrine, deterrence, training, and exercise programs, cooperation with industry, and legal standards. China and Russia have engaged in an increasing number of joint exercises in recent years. These drills aim to help them deter and, if necessary, defeat potential threats, such as Islamist terrorists trying to destabilize a Central Asian government, while at the same time reassuring their allies that Russia and China would protect them from such challenges. Furthermore, the exercises and other joint Russia-China military activities have a mutual reassurance function, informing Moscow and Beijing about the other’s military potential and building mutual confidence about their friendly intentions toward one another. 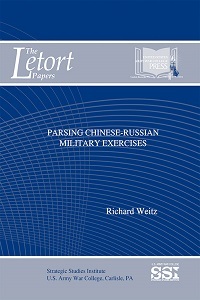 Finally, the joint exercises try to communicate to third parties, especially the United States, that Russia and China have a genuine security partnership and that it extends to cover Central Asia, a region of high priority concern for Moscow and Beijing, and possibly other areas, such as northeast Asia. Although the Sino-Russian partnership is limited in key respects, the United States should continue to monitor their defense relationship since it has the potential to become a more significant international security development. Russian aggression in 2014 caught U.S. policy and strategy off guard, forcing reactive measures and reevaluation of the U.S. approach toward Russia. Moscow employed nonlinear methodologies and operated just beneath traditional thresholds of conflict to take full advantage of U.S. and NATO policy and process limitations. In light of this strategic problem, the U.S. Army War College (USAWC), conducted a wargame that revealed four key considerations for future policy and strategy.